Dwarf Zigzag Scallop 2 by FWC Fish and Wildlife Research Institute, Via Creative Commons. SeaShell News, 3-4-15, Dwarf Zigzag Scallop, Shelling, Captiva Island. “Euvola ziczac, or the zigzag scallop, is a species of bivalve mollusc in the family Pectinidae. It can be found along the Atlantic coast of North America, ranging from North Carolina to the West Indies and Bermuda. Euvola ziczac is known by many names. Previously, its scientific name was Pecten ziczac, but most current literature lists both Euvola and Pecten for clarity. 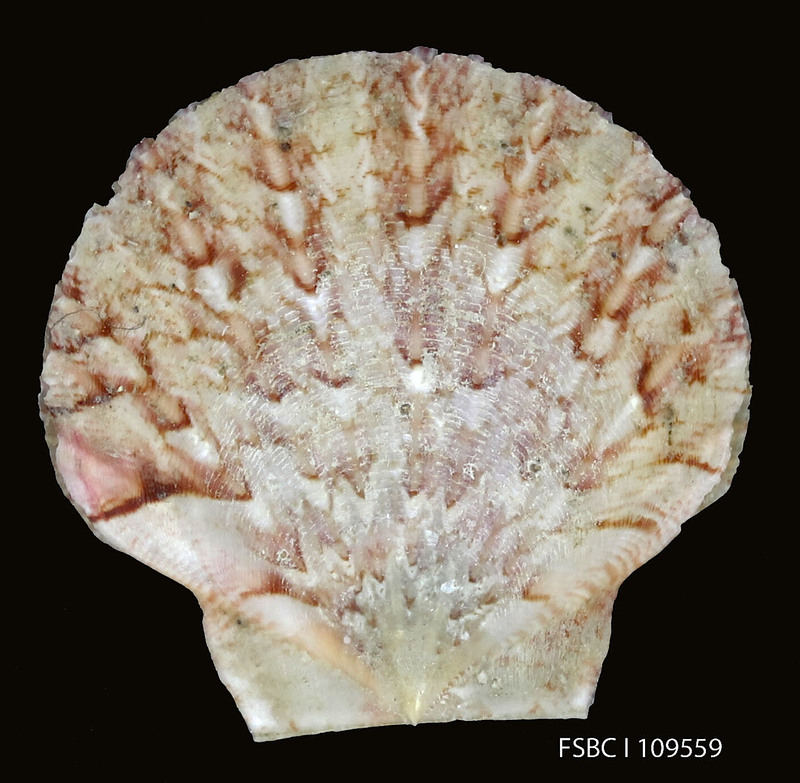 Like other scallops, zigzag scallops bear the characteristic two-valved, calcium carbonate shells that are rounded along the outer edges and flattened at the bottom near the prominent hinges. On either side of the hinge are projecting “ears” or auricles that contribute to scallops’ distinctive shapes. In Bermuda, zigzag scallops commonly grow to 120 mm, but they are generally not as large in the Caribbean. Zigzag scallop shells show a wavy, crenulated pattern along their outer edges and have several colored rays varying from white to orange, yellow, or gray. Within this pattern are well-defined annual rings which make determining a scallop’s age relatively easy to the trained eye. The zigzag scallop’s lower valve is somewhat cup-shaped, whereas its upper valve forms a flat to concave lid. They exhibit a zigzag pattern of stripes on their shells which gives the species its name. Interestingly, it also moves in a zigzag pattern when jetting.